F-actin Staining Kit - Green Fluorescence | Cytopainter (ab112125) fluorescence imaging kits are a set of fluorescence imaging tools for labeling sub-cellular organelles such as lysosomes, mitochondria, and actin filaments. The selective staining of cell compartments provides a powerful method for studying cellular events in a spatial and temporal context. 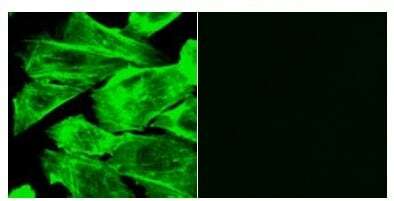 ab112125 is designed to stain F-actins in fixed cells with green fluorescence. The kit uses a green fluorescent phalloidin conjugate that is selectively bound to F-actins. This green fluorescent phalloidin conjugate is a high-affinity probe for F-actins. When used at nanomolar concentrations, phallotoxins are convenient probes for labeling, identifying and quantitating F-actins in formaldehyde-fixed and permeabilized tissue sections, cell cultures or cell-free experiments. ab112125 provides all the essential components with an optimized staining protocol, which is robust requiring minimal hands-on time. 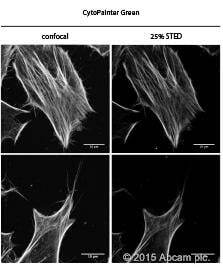 It is an excellent tool for preserving the fluorescent images of particular cells. The phalloidin conjugate has spectral properties similar to those of FITC (Ex/Em = 500/520 nm). It can also be used for fluorescence microscope demonstrations using FITC filter (Ex/Em = 490/525 nm). ab112125 should be stored dessicated. Left Panel: Cells labeled with 1X Green Fluorescent Phalloidin Conjugate for 30 minutes only. Right Panel: Cells treated with phalloidin for 10 minutes, then stained with Green Fluorescent Phalloidin Conjugate for 30 minutes. Publishing research using ab112125? Please let us know so that we can cite the reference in this datasheet. The kit is easy to use. This is an advantage, though the fact that it comes with a buffer to use for the fixation protocol does not allow for easy versatility. Is a bit dis courageous to try using it adding other fluoroscopes and knowing which buffer suits the other fluorophores best. For STED purposes, it could be used, but we found a bit higher the background noise. This might be as well the buffer, we did not test it further. We used not very high STED power and work, but not being better than other dyes we are used to employ for actin staining. Tissues are dissected in 1x PBS. This is followed by dehydration via methanol replacement (25%, 50%, 75%, 100%x3). 1 hour per increase in % methanol. Samples are kept immersed in 100% methanol and stored at -30°C. Samples then undergo paraffin processing (three 1-hr rounds of 100% xylene succeeded by one 1-hr and one 1.5-hr round of 100% molten paraffin wax). Samples are then embedded in blocks of paraffin. Thank you for your protocol information. Using methanol to dehydrate may be causing damage to the actin stucture. Please consider using the following ethanol dehydration protocol. - 30% ethanol in ddH2O for 1 hour. - 50% ethanol in ddH2O for 1 hour. - 70% ethanol in ddH2O for 1 hour. - 95% ethanol for 1 hour. - 100% ethanol for 1 hour. It is possible to keep samples in xylene at RT overnight but preferably only stop after embedding in paraffin wax. I hope the above protocol will be of some guidance. Should you still have unfixed sample, please try one with these protocol. I've tried CytoPainter on my paraffin embedded samples, but it didn't work probably owing to the methanol dehydration step after PFA fixation during the preparation for embedding. To my knowledge, dehydration would be required since paraffin is immiscible in water. Could you suggest alternatives to my current fixation-embedding protocol (or alternative dehydration reagent? Would ethanol work?) that would allow CytoPainter to work with paraffin embedded samples? Could you please provide your fixation and embedding protocols? As fas as I know, I have not come across any protocols that required methanol dehydration steps. Hopefully with this information, I will be able to help troubleshoot your experiment. One more thing, should the 1x green fluorescent phallodin working solution always be prepared fresh? Would it be possible to store the excess 1x working solution at -20C for later use? It is best to prepare fresh solution, so if you do not need to use 10ml in one experiment, then you could start with making less working solution (eg 5ul conjugate in 5mL buffer). Please avoid aliquating 2ul or less as pipetting error will most probably occur. Should you still have left over working solution, then the unused 1x green fluorescent phallodin solution could be stored at -20 oC and protected from light. However, please bear in mind that the staining intensity may not be as strong as a freshly prepared solution. Inquiry: Cytopainter F-actin Staining Kit - Green Fluorescence (ab112125) Will the antigen retrieval step be required for this product to work on paraffin embedded murine samples? Also, can this be used in conjunction with other antibodies to produce double- or triple-labeled sections? If so, at which step should I apply cytopainter? Thank you. 1) Antigen retrieval will be required if you have used PFA or formalin to fix your tissue. I would suggest trying a section that has been retrieved and one that has not. In some cases, antigen retrieval does not increase the signal significantly, so you may actually want to omit that step and save time. Please bear in mind that this depends on your tissue sample and may vary from experiment to experiment based on how well you prepare your tissue. 2) Yes, this product can be used in conjuction with other antibodies for double or triple labelling. Please refer to our "Double immunofluorescence" staining protocol link below. The Cytopainter F-actin Staining Kit can be applied together with your secondary antibody (final 60 min incubation). Since the recommend incubation time for this product is 15-60 min, you may want to check the intensity by various incubation time (15, 30, 60min) and then factor that when you add your secondary antibody. I hope this information will be helpful. If there is anything else that I can help you with, please do not hesitate to contact me.